Porterhouse steaks are made up of two kinds of meat divided by bone. On the large side, the porterhouse is strip steak, which is the outer muscle of the steer, while the small side is the tenderloin, or the inner muscle. 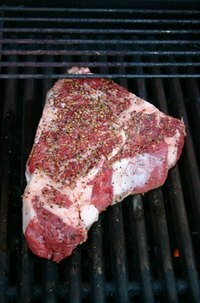 Porterhouse steaks, which are best prepared on a grill or broiled, are one of the higher grades of steak, so they typically don’t require much tenderizing to coax out flavor. Squish it. Put the meat between wax paper or plastic wrap and use a tenderizing mallet, the bottom of a pan or any other blunt object to soften the steak. Take care to maneuver around the bone in the middle of the porterhouse. Cut it. Score the meat with a sharp knife before cooking. Always cut across the fibers. This is a good way to gently tenderize steaks -- although it can allow the juices to escape during the cooking process -- so use this method when cooking time is minimal, for rare or medium-rare steak. Salt it. Applying salt liberally to steak an hour before cooking allows the salt to break down the proteins, so that the proteins trap liquefied fat and meat juices inside the steak while cooking. Before cooking, make sure to rinse off the salt and pat the porterhouse dry to get the fullness of the meat’s flavor. Marinate it. This not only tenderizes meat but adds flavor as well. Look for a marinade that compliments your porterhouse, and let the steak sit in the marinade for up to a day. To be effective, marinades must have an acid to break down the proteins in the muscle. Because porterhouse steaks are known for their quality and flavor, be reserved with the marinade. Steamy Kitchen: Steak Recipe: Turning Cheap “Choice” Steak into Gucci “Prime” Steak.